Pastini Pastaria is an Oregon based Italian bistro with a passion for pasta. Pastini knows that local means fresher and fresher tastes better, and their customers could not agree more. As agency of record for Pastini’s eight restaurants across Oregon, Fish Marketing developed a comprehensive marketing strategy that included a new brand position, search engine marketing, social media, traditional media, and database marketing. Fish Marketing helped Pastini with an email marketing system capable of delivering segmented and personalized communications. The most exciting feature about the campaign is the birthday program, where a Pastini member automatically gets an email for a free birthday entrée a week before their birthday. Fish Marketing also created a new HTML email template consistent with Pastini’s brand treasures. The results? The day the first email was released was the highest day of traffic to www.pastini.com ever, almost doubling the previous record. Open rates surged by 29% over previous emails and click-thrus tripled. 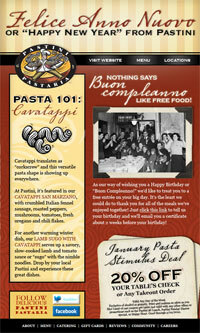 If you happen to be in Portland, Bend or Corvallis, join the Pastini Famiglia, and get a free entrée on your birthday!